Article excerpt: At any given moment, there are numerous prestigious athletes present on Notre Dame’s campus. With currently elite programs — football, women’s and men’s basketball, fencing, hockey, lacrosse, etc. — and a historic repertoire of athletic excellence, Notre Dame has built a reputation for producing strong competitors. However, there are plenty of athletes on campus who do not earn as much publicity. One of these athletes is Matt McCubbins, who works as a tech analyst in the Human Resources department at the University. Matthew McCubbins poses with the silver medal he won in Italy in 2013. A striking figure in his own right — about 6-foot-4 and wire-thin — McCubbins has made a name for himself as a high jumper on the USA Track and Field (USATF) Masters team, with Masters track being the division of USATF for athletes over the age of 35. 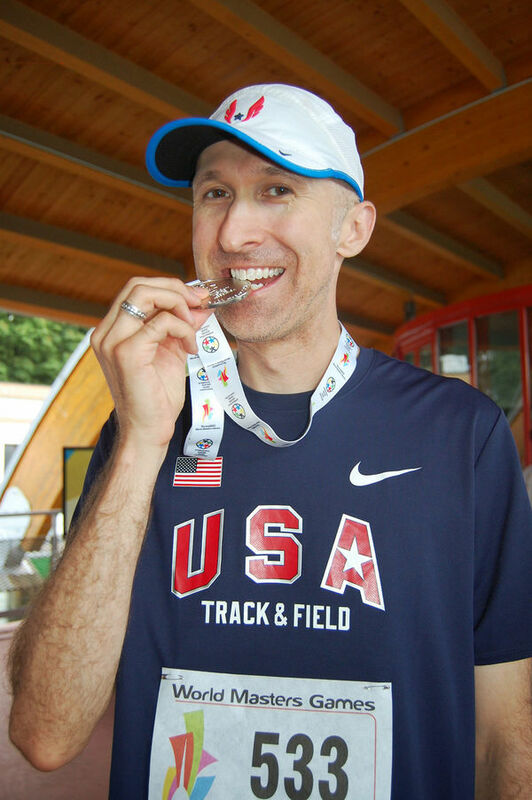 McCubbins, now 47 years old, is often a top finisher in his age group — currently in the 45-50 group — and has won six national titles in the Masters High Jump over the course of his career, which began in 2011. Originally published by Andrew Van Dieran, Observer at ndworks.nd.edu on November 27, 2018.